Preheat the oven to 180 degrees. Spread the walnuts on a baking tray. Sprinkle with a little water. Sift the icing sugar, cinnamon and cayenne over the nuts and toss to coat. Or you could just toast them as is! Bake for 5-8 minutes or until toasted. Set aside to cool. Combine cabbage, snow peas, green onions, pears and mint in a large bowl. Toss gently to combine. For the dressing, combine all the ingredients in a screw-top jar and shake until well combined. 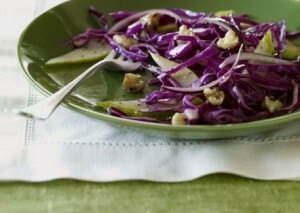 Pour the dressing over the salad, toss gently, add walnuts.